Island visited by 32 members. This is the highest point on Bere Island. Knockanallig is the 1239th highest place in Ireland. 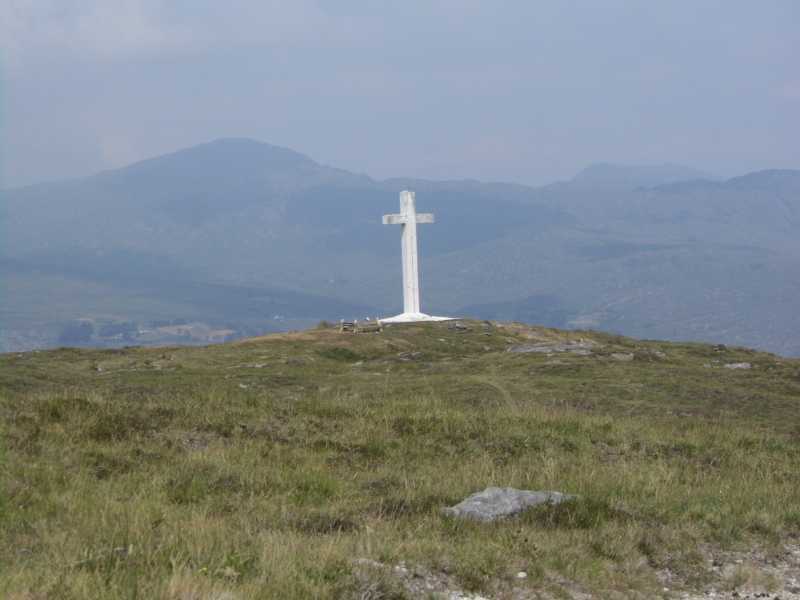 Knockanallig is the most southerly summit in the Caha Mountains area. Picture from TommyV : Cross on the way to the summit. Picture: Cross on the way to the summit. Don't worry the island is bear free. There are a couple of great loop walks around Bere Island. Given it's size we didn't have time to complete them fully. A must is the walk to the lighthouse on the West side of the island. There is room for one car at V68178 43967 A. Over the stile and follow the track south passing one of the old military instillation's that were built by the British and set up all around the island. One or two gate hops and the track becomes more of a path all the way to the lighthouse at Ardnakinna Point V67226 42398 B. If time is on your side you can continue North East on a looped walk of the island, as time was against us we simply retraced our steps.